The closing date for applications is 5pm Friday 22nd February. Shortlisting will take place on Monday 25th, with successful applicants being advised of the time/date of interview asap. Interviews to be held on Wednesday 6th or Thursday 7th March. We are holding two “open” sessions at our offices for anyone interested in this role. Tuesday 19th February 11am to midday. Potential applicants (whether they have already submitted an application or not) are welcome to attend either session, where they will have the opportunity to look around the offices and be given an overview of what the job entails and ask questions of the current post holder and Community Care manager. Please telephone the office on 01642 710085 if you wish to attend on either of these dates. If you wish to apply please send an up to date CV and a covering letter focusing on the person specification requirements. GCSE in Maths and English at grade C or above (or equivalent). ICT skills/knowledge of Word, Publisher, emails, Excel, as well as experience using website and Social Media. Experience of the voluntary and community sector. Car driver with full licence. Innovative approach to resolve challenges and a willingness to adapt to change. Must have an understanding of confidentiality issues. Must have an understanding of Equal Opportunity Issues. Able to form positive relationships with people at all levels. Able to work using own initiative. Work as part of a small team. Work in partnership with other organisations. Willingness to do appropriate training in any area. Location: Stokesley and District Community Care Association, Town Close, North Road, Stokesley (Other locations as required). Context: Reports to Stokesley and District Community Care Association Manager. Recruit, interview, take up references, DBS check, select and supervise volunteers for SDCCA. Create and keep accurate records. Provide written reports for Executive Meetings, attend the AGM and other meetings as requested by the Trustees. Attend appropriate meetings representing Community Care. Travel to Richmond to carry out necessary work linked to Volunteer drivers in that area (duties to be carried out on overtime). Actively promote our services and use appropriate publicity (including online platforms), marketing and networking to recruit new volunteers. Review and update our Volunteer roles. Work effectively as part of a small team, including where appropriate supporting office staff in room preparation for visiting groups using our facilities (includes moving room furniture –chairs/seats as appropriate). Produce newsletters and operate an open door policy for volunteers. Deputise for SDCCA manager when required. Any other duties broadly in line with the overall purpose and level of responsibility of the post. The post holder will need to hold a full driving licence and have use of a vehicle to travel to meetings etc. An Enhanced Disclosure and Barring service Check will be required for this post. Stokesley currently benefits from flood protection provided by the Stokesley Flood Diversion Channel and a number of flood embankments along the River Leven. The existing defences have been in place for a number of years and the Environment Agency now need to investigate how to continue to protect the community long into the future. 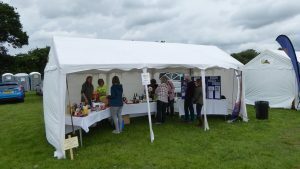 We attended the Great Ayton Summer Fete In June. We invited people to find a luxury hamper, donated by Great Ayton Coop, on our mystery map and also sold ‘mix-up sweet bags’ – which were as popular as ever! We made £74 profit which goes straight into the charity funds. We also attended the Classic Car Show in June in Stokesley. This time we had a very varied tombola – the weather was wet to start but improved as the day went on. Happily we made £374.80 on the day! Which was rounded up to £450 by Rotary – many thanks for their brilliant support. Whilst we need to fundraise, this is also an ideal opportunity for us to let people know about the services we can provide and also an opportunity to recruit more volunteers – who are always welcome! A Day of fundraising and celebration of the life of Jeff Dolby of Stokesley. you give your time to help others and to make our world a better place! To celebrate Carers week we are holding a Tea Party for carers and the person they care for. As well as time spent with other carers whilst your loved one is being looked after there will be a guest speaker. It will be held in the CCA rooms, Town Close. On the 8th June from 10am – 12 noon. To celebrate Volunteers Week, 1st – 7th June 2018, we are holding a display in the Globe (formerly the Library) to let people know how to get involved in their local communities. We will display posters of local groups/charities and organisations who need volunteers to help them operate. There will be ideas of different volunteering opportunities available and information on how to get going. Follow us on Facebook to keep up with any news or events that we might have!